This week we are going to compare two amazing men’s Orient watches side by side. These two watches are from the Orient Star collection, which is a more high-end collection of the Orient brand. Check out the amazing features and timeless style these watches have to offer. 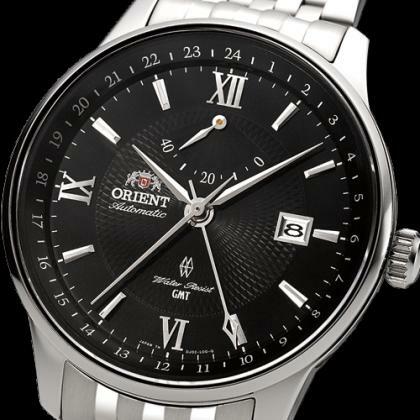 Classic GMT – this featured Orient Star automatic watch has a classic and sophisticated design. As a GMT this watch displays two different time zones, which makes it perfect for travel. This watch also features a sapphire crystal and two dial color variations. A stainless steel band and Roman numeral indices polishes off this sharp style. This watch retails for $840. Star Seeker – this automatic watch also features a GMT, making it perfect for everyday wear. This handsome watch also has an exhibition caseback and sapphire crystal. The Star Seeker is a little larger than the Classic GMT, so if you are looking for a watch with a little more heft, this is the one for you. The dial of this watch is also a little busier than the Classic, which gives it a sporty flare. This amazing watch retails for $1,100.